When your opponent activates a Spell/Trap Card or monster effect that would destroy a monster(s) on the field (except during the Damage Step): Pay 1500 LP; negate the activation, and if you do, destroy it. Marauding Captain and Gagagigo appear in this card's artwork. The former is protecting the latter from the attack of Blazing Inpachi, as continued from Two-Man Cell Battle. This is one of the few Spell Cards that can negate the activation of your opponent's card(s) and destroy them. This card's artwork is likely inspired by the scene in , where Dark Yugi protects Jonouchi and Mai from the attack of The Winged Dragon of Ra. This is supported by the fact both defenders have their right eyes closed, and that the protected are shielding their own gazes using their left arms. Viser Des: You cannot use "My Body as a Shield" against this effect. 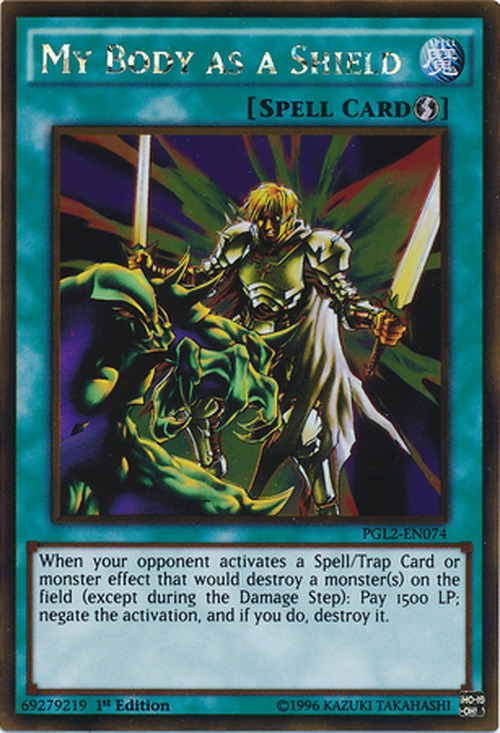 Gandora the Dragon of Destruction: When your opponent activates the effect of "Gandora the Dragon of Destruction", if there is another monster on the field that would be destroyed and removed from play, then you can Chain "My Body as a Shield" to the effect of "Gandora the Dragon of Destruction". : Can "My Body as a Shield" be Chained to the effect of "Gandora the Dragon of Destruction"? Goldd, Wu-Lord of Dark World: If "Goldd, Wu-Lord of Dark World" is discarded by an opponent's card effect and its effect targets a monster(s), then "My Body as a Shield" can be Chained. If neither of the targeted cards are monsters, then "My Body as a Shield" cannot be Chained. 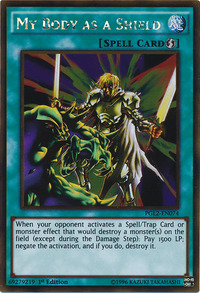 : Can "My Body as a Shield" be Chained to "Goldd, Wu-Lord of Dark World" if it was discarded by the opponent? "My Body as a Shield" will negate cards such as "Dark Hole", "Fissure", "Raigeki", "Eternal Rest", "Nobleman of Crossout", "Tribute to the Doomed", "Thousand Knives", "Trap Hole", "Two-Pronged Attack", "Mirror Force", "House of Adhesive Tape", "Eatgaboon", "Ring of Destruction", "Torrential Tribute", "Bottomless Trap Hole", "Man-Eater Bug", "Blast Juggler", "Dragon Seeker", "Dream Clown", "Throwstone Unit", "Burst Breath", "Swarm of Scarabs", "Cyber Jar", "Tribe-Infecting Virus", "Raigeki Break", "XYZ-Dragon Cannon", "Mega Ton Magical Cannon", "Exiled Force" (negates the effect but will not destroy "Exiled Force" as it is already in the Graveyard), "Offerings to the Doomed" (negates "Offerings to the Doomed" so you do not skip your Draw Phase), "Jowgen the Spiritualist" (when its effect is activated), "Dragon's Gunfire" (if the effect that destroys a monster is selected), or "The Last Warrior from Another Planet" (negates the effect and destroys "The Last Warrior from Another Planet"). "My Body as a Shield" can only be used against effects that will destroy monsters at that time. So you cannot use "My Body as a Shield" when "Tribe-Infecting Virus" is summoned; you can only use it in response to the activation of "Tribe-Infecting Virus"s effect, at which point the effect of "Tribe-Infecting Virus" is negated and "Tribe-Infecting Virus" is destroyed. Also, you cannot use "My Body as a Shield" against cards whose effects will not destroy a monster right away, so you cannot use "My Body as a Shield" against "Jigen Bakudan", "Ekibyo Drakmord", "Magical Hats", "Steel Scorpion", "Toon Monsters", "Thunder Nyan Nyan", "Gradius' Option", "Summoner of Illusions", "Limiter Removal", "Call of the Haunted", "Premature Burial", or "Autonomous Action Unit". You cannot use "My Body as a Shield" against cards whose effects might or might not destroy a monster right away, such as "Earthshaker", "Barrel Dragon", "Acid Trap Hole", or "Time Wizard". You cannot use "My Body as a Shield" against monsters with continuous effects such as "Kotodama" . You cannot activate "My Body as a Shield" during the Damage Step, so you cannot use it against a "Man-Eater Bug" or "Cyber Jar" flipped by an attack, but you can use it when these monsters are Flip Summoned. "Judgment of Anubis" may be chained to "My Body as a Shield". Doomcaliber Knight: If "Doomcaliber Knight's" effect would destroy a monster on the field, "My Body as a Shield" can be chained. Gatling Dragon: You cannot activate "My Body as a Shield" as a Chain to "Gatling Dragon" because it has not yet been decided if any monster(s) will be destroyed or not. Goldd, Wu-Lord of Dark World: If monsters are targeted by "Goldd, Wu-Lord of Dark World", the opponent can chain "My Body as a Shield". Grand Convergence: If there is a monster on the field, you can chain "My Body as a Shield" to this card. Judgment of Anubis: You can activate "Judgment of Anubis" and select a Spell Card that negates the activation of a card and destroys it, like "My Body as a Shield"
Magical Dimension: You cannot chain "My Body as a Shield" to "Magical Dimension", since destroying a monster on the field is optional. Prime Material Dragon: "Prime Material Dragon's" second effect works like "My Body as a Shield". "Prime Material Dragon" can negate cards such as "Smashing Ground", "Nobleman of Crossout", "Shield Crush", "Thousand Knives", "Trap Hole", "Mirror Force", "Ring of Destruction", "Torrential Tribute", "Bottomless Trap Hole", "Swarm of Scarabs", "Dark Armed Dragon", "Raigeki Break", "XYZ-Dragon Cannon", "Mega Ton Magical Cannon", "Exiled Force" (negates the effect but will not destroy "Exiled Force" as it is already in the Graveyard), "Soul Taker" (negates "Soul Taker" so you do not gain Life Points), "Jowgen the Spiritualist" (when its effect is activated), "Dragon's Gunfire" (if the effect that destroys a monster is selected), or "The Last Warrior from Another Planet" (negates the effect and destroys "The Last Warrior from Another Planet"). Trap Monster: When preventing the destruction of “Embodiment of Apophis”, you must be using a card of the appropriate type. You cannot use “My Body as a Shield” to rescue it from “Heavy Storm”. Winged Kuriboh LV10: The Quick Effect of "Winged Kuriboh LV10" can be chained to. You can chain "My Body as a Shield" to the effect.